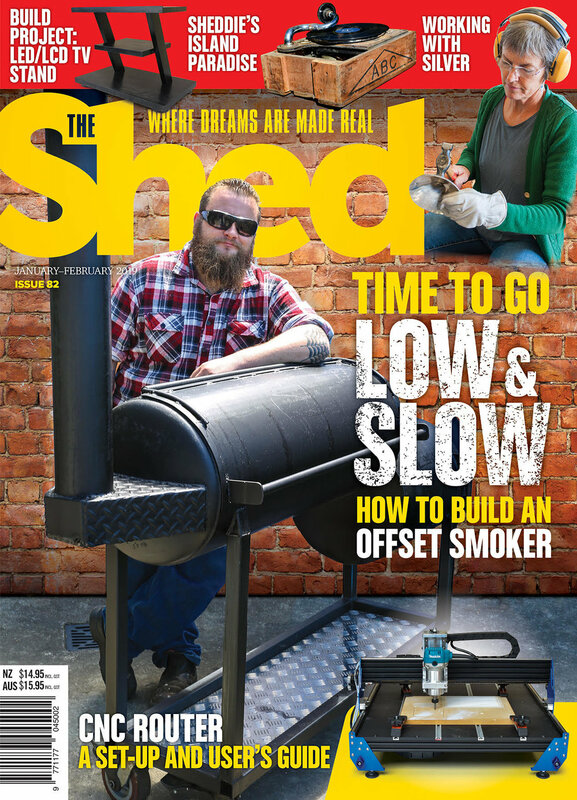 In The Shed 82, the Jan/Feb 2019 issue, its time to join the low & slow cooking revolution - to do that we need to build our own offset smoker barbeque. In our cover story this issue we showcase three sheddies from around the country as they have their own way of making a smoker just the way they like it. Two out of steel and one out of a wine barrel, yes, a wine barrel. We have all you need to know about low & slow cooking with rubs, woods, cuts - the lot. Get building, get smoking and get stuck in. Brent Sandow gives us all the news from the very successful 2018 Auckland Blade Show and we visit the historic Matakohe Kauri Museum in Northland to enjoy the skills all the volunteers display keeping this timber and milling history alive for us all to enjoy. Bob Hulme heads out into the Hauraki Gulf to meet Artie Laven, a Sheddie who is an avid motorbike collector. He has Norton Manx that legendary Kiwi Len Perry rode in the Isle of Man TT in 1951 plus a 1937 War Model 16H side valve Norton amongst others. Nicola Roakes is a silversmith from Christchurch and she shares her incredible skills with us as she makes unique pieces that will last for centuries. Also from Christchurch are Bevan Whiting and Andrew Veitch who jointly own the newly established Christchurch design and manufacturing business Frontal Lobe making unique products using bamboo timber then Jude reckons it's time to install his lathe in his new Wairarapa shed and shows us how he gets the install precice and level as. Coen Smit gets busy making some fun garden ornaments, wooden whirligigs, and Enrico Miglino steps up his mastery of the BBC:bit software in this part four with a fun experiment using some dancing birds. Back in The Shed Issue 80, Mark Beckett explored which CNC router was the one for him. After settling on the Kiwi-made Vertigo M1, he takes delivery of it and shows us how to set it up then operate it and the Autodesk Fusion 360 software. David Blackwell has a step by step guide on how to build a TV stand for a contemporary LED/LCD TV and then Peter Woodford gives his advice on what milling machine is best for you and includes a workshop set-up guide. Enrico Miglino shows us to get to grips with laser cutters and engravers as with the new advances and DIY kits available, laser cutters and engravers are now well within the reach of hobbyists. Bob Hulme is also back again in this issue, this time travelling to visit the Taranaki Aviation, Transport and Technology Museum before we enjoy the breathtaking sculptures of Raetihi sheddie Ray Woodhouse. We complete the issue with a review of the book How to Build a Shed by Sally Coulthard, our new column Off the grid by Murray Grimwood who builds himself a unique energy-efficient fridge then Jude closes off with discussing how when being exact, you need to be very precise.